Getting found online today requires a totally different mindset than when the Yellow Pages dominated the marketing landscape. Yesterday's business motto used to be "Location, Location, Location." Today's mantra is "Information, Information, Information." The way to get found online involves using words, images and video to creatively inform both search engines and web surfers about your products and services - not just once, but regularly and consistently. Think of getting found online as ongoing maintenance rather than merely a task. The other thing to keep in mind is that it takes time to build an online presence because you're starting off at the bottom. It could take as much as 90 days to start showing up on any relevant search, so don't put it off! Why do we go online? We're looking for answers to questions, to compare prices, get directions, read reviews or to watch funny video, right? How do we find these things? We type in keywords into Search Engines. Keywords are the foundation of any search and the place start if we ever hope to get found online. Use keyword research tools like Google's Keyword Tool to discover keywords that people already use to find your products and services, then tailor your website content to include these keywords. Use keyword research to not only create content, but even to determine your website domain name! Website - This is the storefront of your operation and involves a domain name, hosting, and a website design program. You can use an all-in-one program like Weebly for domain registration, hosting and design or look around and find other options. I use Weebly to design my websites, but BlueHost for domain registration and hosting. If you can do-it-yourself, great. If not, hire someone like me to do it for you, but keep aware of what's going on. It's still your business - not your webmaster's. Blog - This is a tremendous platform for information and what you should update regularly. Blogs are "web logs" or pages to record thoughts, ideas, articles, etc., From a business standpoint, it is a place to tell about a new service, offer a tip, brag about an employee, give some helpful advice, tell about an upcoming event. Do some keyword research to tweak about what you want to post (this is for the search engines) then start writing. Add pictures and even video (to make it appealing to the people). Another reason I like Weebly is because it has a built-in blog platform with every website. Business Listings - Did you know that Google offers a place for business to claim a free listing on their Places or Maps page? This is a Big Deal! 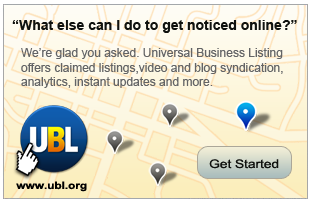 Claim your business listing and include everything you can. It's also a place for people to leave reviews of your business which is very important! This information probably won't change often, but if it does, be sure to update it on your listings as soon as possible. In addition to Google, there are literally thousands of other directories you can get your business into. Rather than invest hours and hours doing all this manually, I recommend using an automated service like Universal Business Listing. Input your information once and they will get it distributed all over the web, according to the package you invest in. All of these listings will contain links back to your website. The Search Engines will see all this corroborating information and will "trust" it. That "trust" will turn into higher search engine results. Media - In case you haven't noticed, videos are a very big deal today. Did you know that YouTube is the 2nd largest Search Engine right behind it's owner, Google? You can create your own YouTube Channel with videos dedicated to your business. Consider having a short company video on your YouTube channel and embedded on your website. Then how about a "How To Video" like the one below we created for Hawkeye Landscaping? What about how you provide a service better than your competition? Any seasonal information to share? Each of these videos will have links and information all leading back to your website raising your standing with the search engines. Use video to set yourself up as an expert in your field and viewers will come to you with questions. The answers you give may eventually turn into sales. Don't underestimate the power of video! To summarize: Getting found online starts with keyword research and regularly sharing interesting and relevant information about your business to web surfers and search engines. The four basic elements to a strong web presence are a Website, Blog, Business Listings, and Media like videos. Use relevant keywords people are already using to search for your business offerings, then feed them the interesting content their looking for along with links back to your website. Think about new things to blog about and videos to create and you'll find yourself climbing the search engines. Sound too complicated? Would you rather have someone else do it? Hire the Arizona Video Company to handle your online marketing. We know how to get found online! Contact us Today! As I always say, business is a vague world and you need to be as intelligent as other people if you want to succeed in this field. It's never an easy thing to stay on top that's why you need to work hard if you want to succeed in business. These tips posted above are all updated. Making a website for your business could get you a lot of prospect clients! I have an online shop and my medium is via my social media platforms. I have etsy, Instagram, Pinterest and facebook. I somehow gain some traction from my channels. I usually interact with the group and find some interesting topics from which I can get involved with. From this site <a href="https://twitter.com/resumes_expert">http://resumes.expert/</a>, I've found some clients who would want to purchase some items from my store. Great nice post but Tips for starting a small business. Address excuses. Countless people dream of becoming entrepreneurs, but they never do. Absorb everything. Listen to what others have to say—friends, family, experts, even yourself. Be a solution. Keep it simple. Count the costs. Imagine yourself with zero money. Earn while you build.